A major fire broke out in Bandipur Tiger Reserve in Karnataka in the second week of March which destroyed more than 320 hectares (ha) of forest cover in the reserve. Bamboo clumps, trees and ground vegetation were all lost in five forest ranges, including the critical tiger habitat. 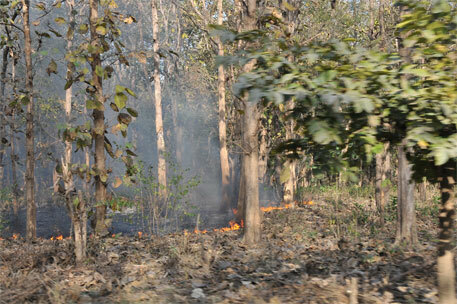 As the forest department struggled to control this, another major fire broke in neighbouring Nagarahole national park. Entire vegetation stretching from the state highway to an elephant camp inside the park was destroyed in the blaze that later spread to about 250 ha of forests, including 100 ha in the tiger reserve and the rest in the Virajpet territorial division in Kodagu. The water in the fire extinguisher vehicle got exhausted and the blaze could not be brought under control for four days. The forest administration in Karnataka was left shocked by the simultaneous fires in the two major tiger reserves. It was during the same time that the forests in Wayanad sanctuary in Kerala caught fire. Around 300 ha forest was gutted in three days in the third week of May. Of the total area destroyed in the fire, about 200 hectares, was in the Begur forest range in the north Wayanad territorial forest division. About 80 ha was in Tholppetty, 10 ha in Muthanga and another 10 ha in the Sultan Bathery forest ranges in the Wayanad Wildlife Sanctuary (WWS). It was assumed that the uncontrolled growth of bamboo accelerated the spread of forest fires in these protected areas. Blaming the locals, the forest department of Karnataka said some “miscreants” had purposefully set the forests on fire. The locals, on the other hand, alleged that the fire was accidental and the forest department was ill-prepared to fight such fires. It was reported that in many places the fire lines or the areas that are cleared of vegetation to stop or slow down a fire were not created and enough manpower was not in place to fight the fire. As the conspiracy theories floated, the Central Bureau of Investigation (CBI) was called in to investigate the cause of fire. A preliminary report, prepared by the forest department in Wayanad, held locals responsible for the fire. There has been a large quantity of dried bamboo inside and outside Wayanad wildlife sanctuary. Bamboo, after flowering, gets dry and easily catches fire. In the preliminary enquiry, it was assumed by the forest department that someone would have accidentally burnt the bamboo. There is a provision to remove uncontrolled growth of bamboo from the sanctuary with permissions from the State Board of Wildlife (SBWL) and National Board of Wildlife (NBWL). It was reported in the newspapers that the forest department had once sought permission to remove excess grass from the sanctuary. The proposal was approved by the state board but rejected by the NBWL. In mid March, a fire broke out on the hilly terrain in Panchpakhadi region of Sanjay Gandhi National Park near Thane in Maharashtra. While only 1.2 ha of forest cover was lost due to fire this year, news reports suggested over 17,200 ha of the total 480,000 ha of forest land have been lost in forest fires during the past five years in the national park. In the first week of May, a fire broke out in Hastinapur sanctuary near Meerut in Uttar Pradesh, killing some wild animals, suggested news reports. As per the Forest Survey of India (FSI) report on Vulnerability of India's Forests to Fires (2012), 42 million ha forest area in 168 districts of the country is highly vulnerable to forest fires. This includes around five million ha of very dense forests, 21 million ha of moderately dense forests and 16 million ha of open forests. Most of the forest fires occur in India between mid-February and mid-June. The forest departments maintain that forest fires may not cause much damage to the fauna as most of the wild animals are adapted to escaping sudden fire mishaps by instinct. However, conservationists share a common concern that post forest fires, the animals may not be able to find a suitable habitat and they are forced to venture out of the forests often coming in conflicts with the human populations. Besides, smaller species such as insects, birds, reptiles and amphibians are directly affected by forest fires. Among the forest-fire incidents that occurred outside protected areas, the major one was in the first week of February when a huge fire broke out on Mount Japfu, Nagaland's second highest peak. The fire was described as one of the country's worst in recent history and it was estimated that almost seven kilometres of the peak was affected. The fire was finally brought under control, with help of Indian Air Force (IAF) chopper that sprinkled water on the forests. In another incident, Seshachalam and Nallamala forests in Andhra Pradesh witnessed about half a dozen fires in the third week of March. Hundreds of hectares of green cover was gutted in the fire. Indian Air Force choppers were deployed there as well to douse the fires. Officials said that while the forest fires in Seshachalam was a deliberate act by red sander smugglers or animal poachers, the Nallamala fire was caused accidentally. In the last week of April, regular incidents of forest fire in Koraput and Jeypore forest divisions of Odisha led to large scale destruction of green cover, including the minor forest produce such as tendu and Mahua. Fire-fighting and fire management has taken a back-seat as the morale of the forest department is low today with a total lack of political will. The department needs to be rewarded for managing fire-lines and fighting fires, instead they are ignored, ill-equipped, and sometimes at the receiving and of people's wrath if they try to stop fires. Its a free for all, and our precious natural heritage is LAST on the list of priorities for anybody. Thanks Down to Earth for sharing an article on forest fire.